An Extensive Green Roof! What Is It And Can I Have One On My Shed? Is An Extensive Green Roof Right For Your Shed? What is an extensive green roof? You may have heard the phrase and wondered what it means. With concern rising about the already taxed urban drainage systems these fixtures are becoming increasingly popular on large structures. Green roofs are an excellent way to slow down the water that runs off roofs after heavy downpours and causes flooding in urban areas. For a shed the flooding aspect is not so important, it is a type of rooftop garden that replaces the space taken up by the shed and helps by providing a habitat for bees and other pollinating insects. There are two types of green roof construction; extensive and intensive. Intensive green roofs are the traditional garden roofs and can support a varied selection of plants. Intensive green roofs require a depth of soil of about 600mm, require irrigation, weeding and care. The extensive type of green roof, by contrast have a soil depth of 50-150mm, only support very drought tolerant plants (no irrigation) are too harsh an environment for most common weeds and so require very little maintenance. Given those advantages only the extensive green roof, will be discussed here. With the lowered weight, expense and less maintenance involved this type of roof is a good choice when you want an ecologically friendly roof with less hands-on work. Extensive green roofs have shallow soil which usually between 50 to 150 mm depending on the type of plants that are to be grown. The types of plants that can thrive on an extensive green roof include many varieties of sedum, semper-vivum, grasses, mosses, alpines and even some flowering herbs. When choosing your plants make sure that they are tolerant to heat, wind, frost, and drought so that constant replacement will not be required. Before you begin to build your extensive green roof you must first ensure that the shed you are installing it on is up to the load requirements. The typical self weight for a roof of this type ranges from about 100 to 150 kg/m2. Existing sheds will most likely need strengthening to handle this load. New sheds should be specifically designed with a roof structure strong enough to support the weight of the soil as well as the usual access loading. The weight of the material when fully saturated can weigh more than standard river rock ballast. 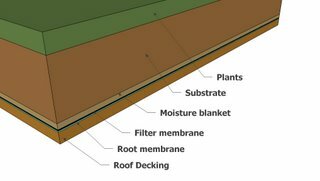 Your green roof deck comprises six different layers. The bottom most layer is your actual roof deck which is usually comprised of roof grade WBP plywood with a normal roofing felt for protection and waterproofing. The next layer will be a rubber sheet or PVC that is used as a root membrane to prevent the root systems from penetrating the lower deck. The third layer up will be a filter sheet to stop the fine material in the soil from being washed out. Above that a moisture retention blanket is placed to keep the moisture closest to the growing medium (this can be a specialized item but I have seen cardboard and towels used). Next comes the growing medium itself this is recommended to be a mixture of aggregates (stones, crushed brick) and light soil. The thickness of soil substrate starts at about 50 mm up to 150 mm depending on the type of plants you wish to grow. The minimum roof slope should be no less than 1:60 so that water is positively drained from the roof and does not stay around to find leaks. The steeper the slope the better up to about 10 degrees. Above 10 degrees consider the use of timber frames to help stop the soil from slumping down the roof slope. Don't install a green roof on a roof that is steeper than 30 degrees. If you do then you will experience problems with the soil slumping, the ridge drying out and the bottom edges over saturated. An extensive green roof can be both very beautiful and eco-friendly when added to your shed. It can provide a wonderful spot for birds to rest and for helpful insects to thrive. It also helps to reduce the amount of drain-off that the already overtaxed urban systems are being asked to handle. All it takes is a little planning and some elbow work and you will be enjoying your green roof for some time to come.